Am I the only one who has a secret stock of berries of the last season which has to be used urgently before the berries of this season are ripe? Beside a small package of blackberries I saved a pound of red currant all winter long. And as the currant bushes in my parents garden already promise a rich harvest I had to make room in the freezer. And so I baked my favourite “Ribiselkuchen”. It is a simple cake with shortcrust tarte shell and a filling made of meringue, almonds, bread crumps and berries. 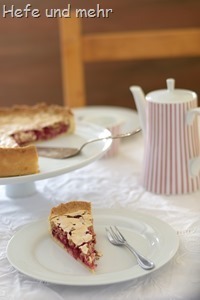 The bread crumbs keep the berry juice from soaking the tart shell. And as I used roasted crumbs – which were meant for bread originally – the filling has a deeper flavour as the more traditional way with unroasted crumbs. Sometimes I see a recipe and I have directly a person in mind who would be like it as small treat. 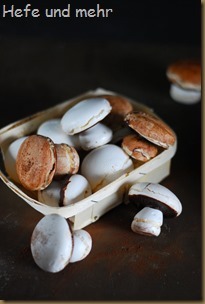 That happened to me, when I saw the little meringue mushrooms on Food52 shortly before christmas. At this time it was already to late but I kept it in mind the whole year and made it this week as little Christmas present for someone who loves to go on a mushroom foray. And I was surprised who simple they are made. Who ever made some meringue before will do this easily. You just have to pipe flat, round hats with a big piping tip. The stems are made by moving the tip slowly upwards and the lamella are made by dipping the bottom side of the hat into molten chocolate. You see, it is really easy to do but the effect is great! A perfect gift for mushroom fan! Why did I wait so long until I tried this recipe? I don’t know! It is a simple recipe with three components that promise dessert heaven on earth: Meringue, cream and fresh fruits. And like Eton Mess the magic of pavlova consists of this mixture of crunchy and soft, sweet and sour and this made the dessert irresistible. I saw Pavlovas on many food blogs before: Claudia bake them, and Paule, Nicky and Barbara made them some time ago, too. And every time I read one of their posts I thought: I have to try this! But I didn’t do it until this weekend. 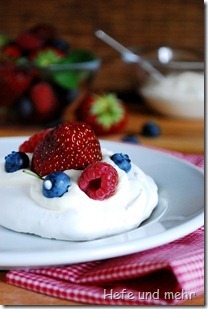 When we bought some delicious berries (strawberries, blueberries and raspberries) I decided that they would be great for a pavlova. I like the miniature version of the dessert that Claudia bake and so I decided to do single portion pavlovas with a diameter of only 10 cm and a little pit in the middle to keep the cream. The recipe is really simple only waiting for the meringue to bake/dry takes some time. And you will be rewarded with a delicious dessert for your patient waiting! A great recipe for the summer!